Spain, Italy, Austria and many more. I studied Civil Engineering, Music and Drama at the National Drama School and worked for many years as an actress. But my passion for wine led me to its magical world. I attended the Wine and Spirit Educational Trust School and I work as a wine journalist for the most prestigious magazines, such as Gourmet, Athens Insider and Oinoxoos. I love discovering the wine world and I have been in places like Argentina, Chile, Uruguay, France, Spain, Italy, Austria and many more. I am a member of #winelover, the most active wine community in the world, and I am an animal lover, working for the welfare of strays for years. After 4 years of work I have finished my research on the history of Mount Athos winemaking. My book will be published in 2018. 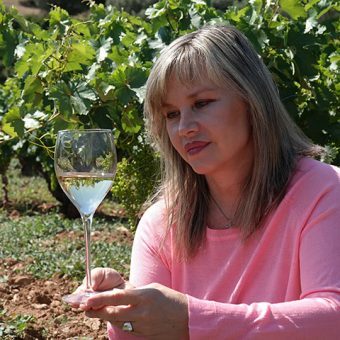 I love the vineyards of Attica and I believe in their potential, so I created the Wines of Athens, a group of Attica wineries, to promote the vineyards and the local Savatiano grape variety. Greece is an exciting ‘new and old’ wine land with a fantastic arsenal of indigenous varieties. Its highly awarded wines have been acknowledged by internationally acclaimed opinion-leading wine critics. Follow me to explore the magnificent world of Greek wine.